One of the major changes over the last few months has been the fall in oil. To listen to some people this is a bad thing, representing weak demand and general economy. Actually it isn’t. There is good news here too. But what is going on with oil? Who will it benefit, and not and where will that take us. Brent Crude Oil prices, the dominant oil contract, have tumbled down to around $85 as of this month from its peak in June this year at $115 per barrel, a 26% fall that may well keep going. First let us dispel some myths… despite all the hullabaloo about ISIS running rampage in the Middle East and Russia’s ongoing meddling with Ukraine, neither has had much effect in oil prices. OPEC, once all mighty, finds its members mostly in dire straits and in need of keeping the drills pumping oil to rebuild their economies, case in point being Iraq itself, Libya, Iran and Venezuela, the latter losing out to lower prices as it depends on oil to pay for its generous subsidies of all things dear to late President Chávez. 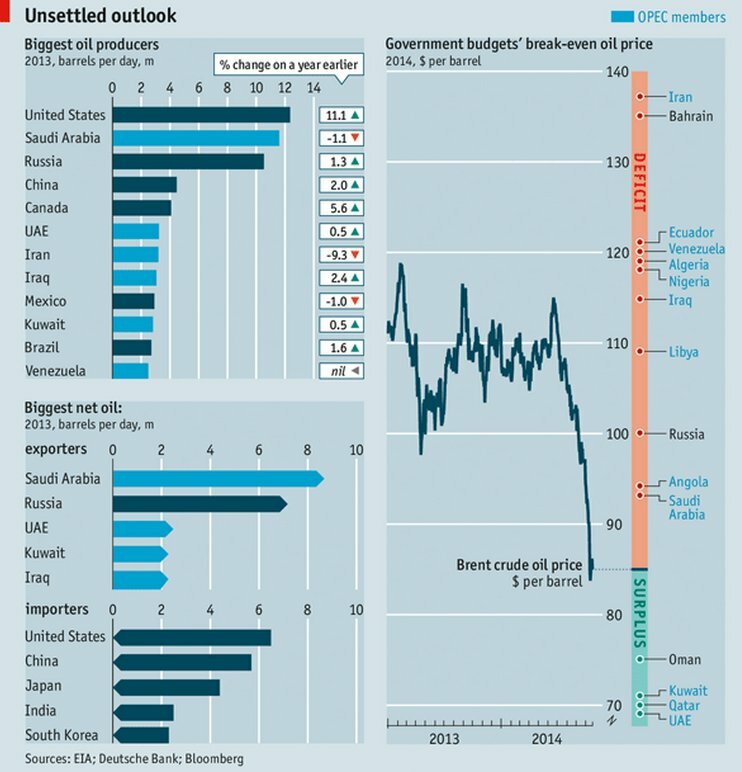 Saudi Arabia however is completely unfussed thanks to its plentiful funds to cover its expenses, and in fact hopes to gain market share at the expense of western competitors whose higher cost margins will force them out of the market as prices keep going down. But how much more can producers in the Americas take in? Break even for US shale-oil producers stands at $70 and falling due to improvements in fracking techniques, for the tar-sands in Canada however the picture looks a lot more bleak, not to mention producers further south lacking the means and capital to tap their dormant reserves such as Mexico, Venezuela and Brazil. 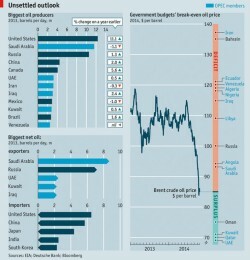 For any of these countries lower prices mean tighter budgets and fiscal pain to come. On the other hand, the boom in America is a great opportunity for oil infrastructure companies as the country lacks the means to transport and refine its new found oil wealth, that is as long as all prices do not fall too far beyond 70 USD. As for the dragon in the room, financial analysts in China, the world’s second largest net importer of oil, expect the fall in prices will smooth down the recent slowdown in the economy. The government itself is taking this opportunity to stockpile oil to provide for when prices rise again, while actual demand for “black gold” is at its lowest since the 1990s. China’s frenetic hoarding, however, is not enough to offset lower demand from a flagging Europe and a still recovering America, both risking deflation and growing debts as oil prices keep falling, and since slower economic activity is the main source of falling prices, the West is risking a deflationary spiral that may well send its economies back to recession. Digging deeper beneath the great trends in the global economy, one industry poised to make gains out of lower oil prices is the agricultural sector. Dependent on transport, petrol fuelled machinery, energy intensive infrastructure and oil based fertilisers, farmers and agribusinesses will benefit from lower input prices, which ought to encourage investment in the sector, thus benefitting their providers, not to mention governments such as America’s and India’s who spend billions each year in farm subsidies. Airlines and the automobile sector are to expect lower cost margins too, offering some relief after years of severe losses, whether lower prices will be passed on to their customers is yet to be seen. For the most part it is good news indeed for consumers world-wide, prudent oil exporters, farmers and airlines, at least for the time being. In the medium to long term however, low economic activity, the source of low demand for oil and falling prices, risks throwing the West back into recession through a deflationary spiral. It might not be like the 1970s, but “black gold” can still pack a good punch to developed economies. In the end good news, as goes the tired cliché, can become very bad news.